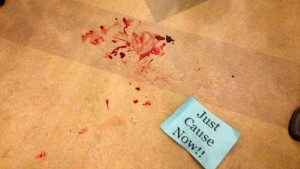 The Alameda City Council Has Blood On Its Floor. Alameda City Council erupted on Wednesday, November 4th, as the Alameda Renters Coalition collided with Alameda landlords, and ultimately the police, over rising rents and the right to be heard. It began, as it usually does, with stupidity. Official stupidity. Instead of behaving like a civilized human being, Alameda City Official Bob Haun took it upon himself to shove with both hands a 68 year old Alameda Rental Coalition member protesting rent hikes, causing the protester to fall to the ground. This led to a chain of events in which Haun himself then fell in an undetermined manner (and reportedly suffered a hip injury), a protest organizer was arrested, and the original protester, the one trying to gain access to the Council Chamber and who was repelled by Mr. Haun, was grabbed by two Alameda Police officers and then slammed to the ground, ultimately leaving behind the blood you see to the right. ...the City Council did not realize the magnitude of the issue in front of them... there is a level of desperation to the renters community after hearing story after story of evictions and rent hikes. 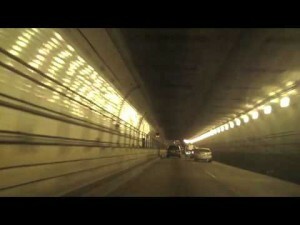 Alameda can no longer look through the Webster tunnel and snicker at Oakland's troubles with its police. As otherwise oppressive as they are, the Oakland Police have yet to figure out the benefit of attacking a sixty-eight year old transgender person within a few feet of City Council chambers during a Council meeting and leaving the person's blood on the floor of City Hall. You can see two other videos, taken from outside the chamber, which show the large group of protesters in the corridor, events at the door to the chamber from the other side, and the takedown and arrest of the protester by the Alameda police. You can read one reporter's account of the incident in the East Bay Express. There is no excuse for violence against a bunch of people waving signs and wanting to excercise their constitutional rights and rights under the California Brown Act to speak at a public meeting. The lone policeman at the door seemed to have behaved with restraint, but the two he called for backup went berzerk when they tried to arrest the aged protester - this in a tight and confusing situation with other older people and children immediately near. Had the crowd been of a different mood, those police through their intemperate actions could have precipitated a riot. They both should be fired immediately, and Mr. Haun should be charged with assault. but the Alameda City Council is going to have to live with having had blood spilled on its own floor, through its own inaction, for some time to come. Last evening, an estimated 200 Alameda renters went to their city council to demand an end to unfair rent hikes and displacement. After a hearing that lasted past 1am, the Alameda City Council voted unanimously for a temporary 8% rent increase moratorium and a ban on no cause evictions. This is a big step forward for a city in which rent increases have been unregulated to date, but it is clearly not enough. The City needs to adopt a rent control ordinance that ties rent increases to the inflation rate and prohibits no cause evictions. Tenants Together is proud of The Alameda Renters Coalition, a member organization of Tenants Together, and all of the Alameda residents who went to City Hall to take a stand against unregulated rents and evictions. The time for rent control in Alameda is now. Many renters were excluded from the hearing room. 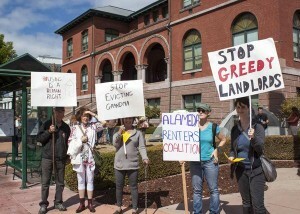 As landlords testified inside, a crowd of Alameda renters gathered and eventually began chanting, “let renters speak” in the hall outside the council chambers. Police tackled one protestor to the ground where he lay bleeding and restrained by police. The police also arrested an ARC leader. Both were taken into custody in front of the crowd of renters that included families with young children. Tenants Together is deeply concerned with the use of force and arrests of protesters renters. Police must respect and protect the rights of renters who come to their City Council to be heard about rising rents and displacement. Tenants Together calls for the immediate release of the protesters and an investigation into the entire incident. Call Alameda County District Attorney, Nancy E. O’Malley at (510) 272-6222 and email her info [at] alcoda.org and the City of Alameda’s mayor Trish Herrera Spencer (phone: 510-747-4701 email: tspencer [at] alamedaca.gov) to demand the release of the tenants arrested at the Alameda City Council meeting last night.